6 rounds (.45 ACP) "subcompact"
The SIG Sauer P250 is a semi-automatic pistol made by Sigarms (now known as Sig Sauer Inc. of Exeter, New Hampshire). Introduced in 2007 the SIG P250 can be chambered in .22 Long Rifle, .380 ACP, 9×19mm Parabellum, .357 SIG, .40 S&W, and .45 ACP. The P250 chambered in 9×19mm Parabellum was introduced to the North American market on November 7, 2007 followed by the .45 ACP compact model in February 2008 at the SHOT Show. The last of the models were introduced in late 2009. In early 2014, the SIG P320 was introduced. This striker version of the P250 continues the modular format and shares several of the same components as its hammer-fired sibling including magazines and grip frames. As of January 25, 2017 the only available caliber for the P250 on both the SIG Sauer website and their online catalog is the P250-22 Nitron Compact .22 Long Rifle. Exchange kits can convert the P250 from .22 Long Rifle to 9mm, .357 SIG, .40 S&W and .45 ACP. SIG Sauer P250 Sub-Compact disassembled into its major components. Top: P250 Full Size, middle: P250 Compact (with the trigger group removed), bottom: P250 Sub Compact. The P250 has no manual external safeties. Instead, A firing pin block aids to prevent the weapon from accidental discharge. The handguns are available with a dark colored Nitron slide surface finish, two tone finish, where the stainless steel slide has an untreated surface, and a diamond-plated finish. The grip module on the P250 Compact was changed in 2009. This change makes that the original and new style grip modules use different magazines. These old magazines are not compatible with new grip modules; the accessory rail was changed as well from a curved rail to a Picatinny rail. The factory holsters of the original grip modules do not fit newer grip modules featuring Picatinny rails though the modular nature of the firearm allows the original grip modules to be easily swapped out with the new version inexpensively. In 2012, SIG Sauer introduced a medium width version of the subcompact grip module with the Picatinny rail. The small width versions of the subcompact does not have this. Also introduced were exchange kits for a .380ACP and a .45ACP caliber subcompact version. For Dutch police service the Dutch government intended to order about 45,000 PPNL pistols (a P250 DCc variant)[dead link] in 2011 to replace the Walther P5 used by the police and Glock 17 in use as a stopgap measure by the Arrestatieteam (the SWAT team of the Dutch police). In March 2011 the Dutch government informed the Dutch parliament that Heckler & Koch and Walther had sought a preliminary injunction against the intended order for PPNL pistols. The Volkskrant newspaper wrote: "the choice of the SIG-Sauer earlier this year evoked surprise with representatives of both the arms industry and police unions. During police tests there was a strong preference for a pistol made by Heckler & Koch." According to the court verdict on 28 March 2011 there were no manipulations involved during the public tender process and the order was finalized. On 8 November 2011 the Dutch Minister of Security and Justice formally declared SIG Sauer in default and immediately dissolved the order following the fourth negative production sample test of PPNL pistols firing Dutch police issue RUAG Action 4 NP ammunition by an independent German testing institute (Beschussamt Ulm). Minister Ivo Opstelten found that SIG Sauer could not deliver the requisite quality in a mass production setting and had some harsh comments on SIG Sauer: "On the basis of the results of these tests I no longer find it responsible to continue with this pistol. There is no longer enough confidence in the quality of the pistol, nor in the capacity of the manufacturer to improve the quality or safeguard it. All this brings a risk to the safety of police officers on the street." The Minister delegated a (legal) review to examine the possibility of coming to an agreement with one of the other suppliers that has had their pistol operationally tested in the procurement procedure. United States: The Federal Air Marshal Service signed a multimillion-dollar contract for procurement of the SIG Sauer P250 Compact chambered for the .357 SIG cartridge in 2009. The order was cancelled and the FAMS continue to carry the current P229. ^ "Sig Sauer Introduces New P250 Pistol To US Market". ^ Scepaniak, Adam (January 25, 2017). "BREAKING: P320 Remains as the Lone Modular Pistol; P250 is DISCONTINUED". The Firearm Blog. ^ "P250 - Sig Sauer". Sig Sauer, Inc. Archived from the original (Website) on 26 January 2017. Retrieved 29 January 2017. ^ "Sig Sauer P250 Now Offered In Two Tone Finish". ^ a b "Significant changes to SIG P250 Compact". thefirearmblog.com. Retrieved 8 March 2017. ^ "Nieuw pistool voor Nederlandse politie, www.rijksoverheid.nl (Dutch)". 2011-01-27. Retrieved 2011-01-29. ^ "New Gun for Dutch Police, www.rijksoverheid.nl". 2011-01-27. Archived from the original on 2011-07-23. Retrieved 2011-01-29. ^ "Nederlandse politie krijgt nieuw pistool, www.volkskrant.nl (Dutch)". 2011-01-27. Retrieved 2011-01-29. ^ "Aankoop politiepistool niet zuiver, ww.nu.nl (Dutch)". 2011-01-28. Retrieved 2011-01-29. ^ "Het nieuwe politie pistool deel 1, SAM Wapenmagazine 156 (Dutch)" (PDF). Retrieved 2010-06-29. ^ "Het nieuwe politie pistool deel 2, SAM Wapenmagazine 158 (Dutch)" (PDF). Retrieved 2010-06-29. ^ "Het Nieuwe Nederlandse Politiepistool, www.politieparcours.eu/npnp.htm (Dutch)". 2011-01-28. Archived from the original on 2011-02-25. Retrieved 2011-01-30. ^ "Sig Sauer is de winnaaar, Politievakblad "Blauw" (Dutch)" (PDF). 2011-02-19. Retrieved 2011-03-23. ^ "Langer wachten op nieuw pistool door kort geding, www.volkskrant.nl (Dutch)". 2011-03-04. Retrieved 2011-03-04. ^ "'Corrupte agent speelde rol bij koop dienstwapen', www.volkskrant.nl (Dutch)". 2011-03-23. Retrieved 2011-03-23. ^ "'Procedure politiepistool niet gemanipuleerd', www.volkskrant.nl (Dutch)". 2011-03-28. Retrieved 2011-03-28. ^ "Court decision LJN: BP9335, Rechtbank 's-Gravenhage, 387099 / KG ZA 11-158 en 387180 / KG ZA 11-163, www.rechtspraak.nl (Dutch)". 2011-03-28. Archived from the original on 2011-07-20. Retrieved 2011-03-28. ^ "Opstelten besluit overeenkomst SIG-Sauer over nieuw politiepistool te beëindigen (press release), www.rijksoverheid.nl (Dutch)". 2011-11-08. Archived from the original on 2012-03-05. Retrieved 2011-11-08. ^ "Ontbinding overeenkomst aanschaf nieuw dienstpistool politie (letter to the Dutch parliament), www.rijksoverheid.nl (Dutch)" (PDF). 2011-11-08. Archived from the original (PDF) on 2012-03-03. Retrieved 2011-11-08. ^ "Nieuw politiepistool afgekeurd, www.rijksoverheid.nl (Dutch)". 2011-11-09. Archived from the original on 2012-03-05. Retrieved 2011-11-09. ^ "> Law Enforcement". SIG Sauer. Archived from the original on 2012-03-11. Retrieved 2012-03-03. ^ "> 'Women-friendly' guns move". Manchester Evening News. Retrieved 2017-02-17. ^ "Page Not Found". Sig Sauer. Sig Sauer Inc. Retrieved 10 January 2018. 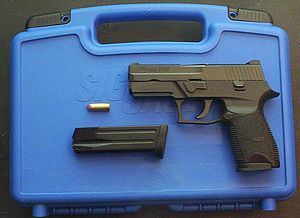 Wikimedia Commons has media related to SIG Sauer P250. Wikimedia Commons has media related to SIG P250 DCc.